Please Welcome the Newest Member of the Team! Hello Again Fish Sauce Family! We’re incredibly excited to announce the addition of Patricia Mou to the Fish Sauce team! As our new Marketing Intern, Patricia will lead our social media outreach and assist Fish Sauce’s growth marketing and analytics initiatives. Our first interaction with Patricia came via Instagram during Season One, when she reached out with suggestions for speakers and actionable feedback for the podcast. Later that summer, we bumped into Patricia in person at Rooster and Rice in SOMA and shared our vision for the summer Female Founders Series. On the spot, she gave us a list of awesome female leaders whose stories would inspire others. Patricia brings a wealth of experience in consulting and consumer product analytics to the team, and we cannot wait for Patricia to leverage the lessons she’s learned at an on-demand logistics startup to continue to grow and improve Fish Sauce. Patricia is the daughter of Korean and Chinese immigrants who came to the States to pursue higher education in New York. At the age of seven, Patricia moved to California’s Bay Area, where she spent the rest of her childhood. Long interested in Asian-American representation in media, Patricia interned at Audrey and Hyphen, two Asian American-centric magazines, in high school. Eddie Huang, Wong Fu Productions, Connie Chan (a16z), Julie Zhou (Facebook), Aileen Lee (Cowboy Ventures), and Susan Su (500 Startups). We were ecstatic to interview Phillip Wang of WongFu Productions for Season Two, and we hope to land more of these shared role models as we continue along our Fish Sauce journey! Making sure Patricia gains valuable exposure and worthwhile experiences. In the 10 months since launch, many of our listeners and friends have offered to help Fish Sauce in a variety of ways. We are deeply appreciative of these offers, and consider them to be a validation of the need and impact of our mission. We also consider hiring to be one of the most challenging aspects in growing a startup, and have been hesitant in bringing people on as we want to make sure any additions to the team are set up for success with clearly defined projects. We believe that a new team member can be either a multiplier or divider, and are highly optimistic that Patricia will prove to be the former as we embark on the next chapter of our Fish Sauce journey. We define ourselves by our mission; inspiring others to discover their Secret Sauce and take a leap of faith from traditional career paths by sharing the stories of successful Asian-American entrepreneurs, investors and operators. Patricia’s commitment to that mission and desire to make an positive impact on our listener growth and engagement make her an ideal addition to the Fish Sauce team. Please join us in welcoming Patricia as our newest member of Fish Sauce! We greatly appreciate all of your ideas and feedback, and encourage you to reach out to us on social media or at fishsaucepodcast@gmail.com. Look out for Season 2 starting Monday, November 6. We’ve set a Season Two release date. All of our episodes are now on YouTube. As always, we are extremely grateful for the continued support from the Fish Sauce Family and excited to share what has been happening with us! We have set a release date! Episode One will be available via your favorite podcast provider and our YouTube channel (more below) on Monday, November 6. We will be releasing a new journey into the minds of successful Asian-American founders, operators and investors every other week, and can’t wait to bring another batch of Secret Sauce to our listeners. As we ramp up to Season Two, expect more action from us on LinkedIn, Twitter, Facebook, and through our Fish Sauce Family newsletter! One of the many challenges of the side hustle/startup reality is the evergrowing list of things you’d “like to do”. “Have a YouTube presence,” has been on that list for a while. We’re excited that our episodes are now available through another outlet with high ease of shareablity. We’re even more excited to be able to organize our content catalog by job role. This will make us a better resource for those looking to move to tech but confused about the specifics of Entrepreneur, Investor and Operator roles, which is one of the reasons we started the podcast in the first place! Check out Season One and the Female Founders series on YouTube! Before we move ahead to next season, we wanted to take a look back at how our Female Founders summer series came to be and some of the lessons we will take from it moving forward. When we first started working on what would become Season One of Fish Sauce, our primary goal was putting together a quality lineup of guests that would be comfortable sharing their stories with the two of us. It was only after the conclusion of our interviews that we realized the lack of gender diversity. Of the nine episodes we recorded, only one featured a female guest. Part of the Fish Sauce mission is to give voice to an underrepresented population, and we have spoken with numerous guests about how to challenge biases, both conscious and unconscious. That does not mean we are immune to our own. As we began to release Season One and started receiving contacts regarding prospective Fish Sauce guests, we came together to discuss a more equitable way forward. Our immediate solution was to dedicate our summer season to showcasing Female Founders, so we reached out exclusively to badass female entrepreneurs. We ended up interviewing three truly badass female leaders, and remain extremely grateful to each for sharing their unique perspective and some of the lessons they’ve learned. From Bebe Chueh, Co-Founder of Atrium, we learned about risk in both our personal and professional worlds. From Tenzin Seldon, Co-Founder and CEO of Kinstep, we learned to channel life’s difficulties in a positive direction. And from Maureen Fan, Co-Founder and CEO of Baobab Studios, we learned we are privileged to be spared certain decisions. We continue to learn everyday about who we are as both podcasters and people. As we make our way through our personal and professional journeys, we promise to adapt, improve, and listen. Use code “fishsaucefamily” at the Swag Store to get 20% off a treat for you or a gift for someone else! Thanks again to you, our Fish Sauce Family, for your gratitude, love, and support. Hello again 👋 Fish Sauce Family! This summer was jam packed! We were super excited to launch our summer series featuring Female Founders and ended the summer with a momentous week, lots to celebrate! We are extremely grateful for the continuous support from the Fish Sauce Family and excited to post again about what has been happening with us! On 23 August we hosted our first Fish Sauce Live event in San Francisco. The event ended up selling out, with over 80 people in attendance! We were honored and shocked by the turnout, which surpassed any of our wildest expectations. When we first thought of doing a live event, we never imagined it would be this successful. We’ve been searching for alternative environments and platforms through which we can connect with our Fish Sauce Family, and our thinking was that a live show would be a great way to skip the soy sauce and try something unconventional. In brainstorming speakers, we wanted to showcase diverse types of founders and entrepreneurs. 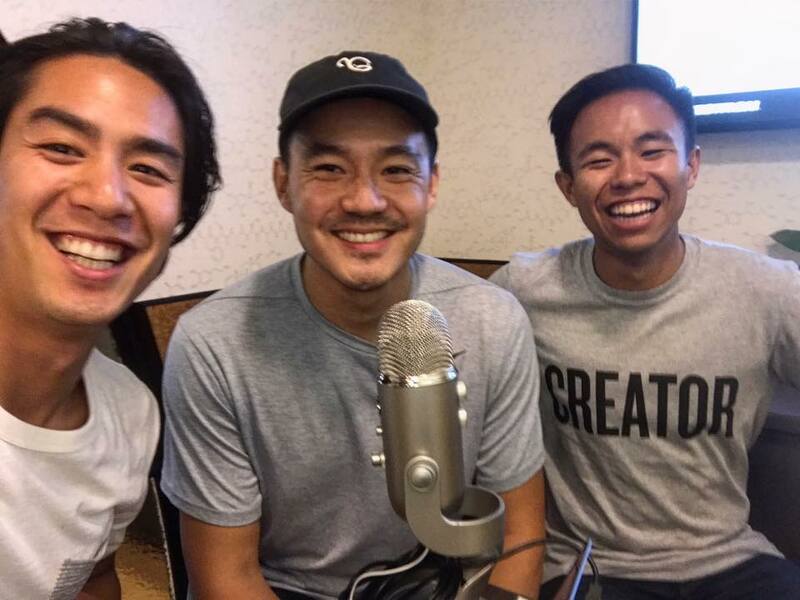 By inviting The Boba Guys (Andrew Chau and Bin Chen) and Atrium Legal Service co-founder Bebe Chueh, we were able to share stories from both food/beverage and legal tech; two very different industries! Thanks to everyone who made it out to the first Fish Sauce Live event. Video of the live show is coming soon! Fish Sauce Live was only one highlight of a very busy week, as it coincided with the launch of the Fish Sauce Swag Store! 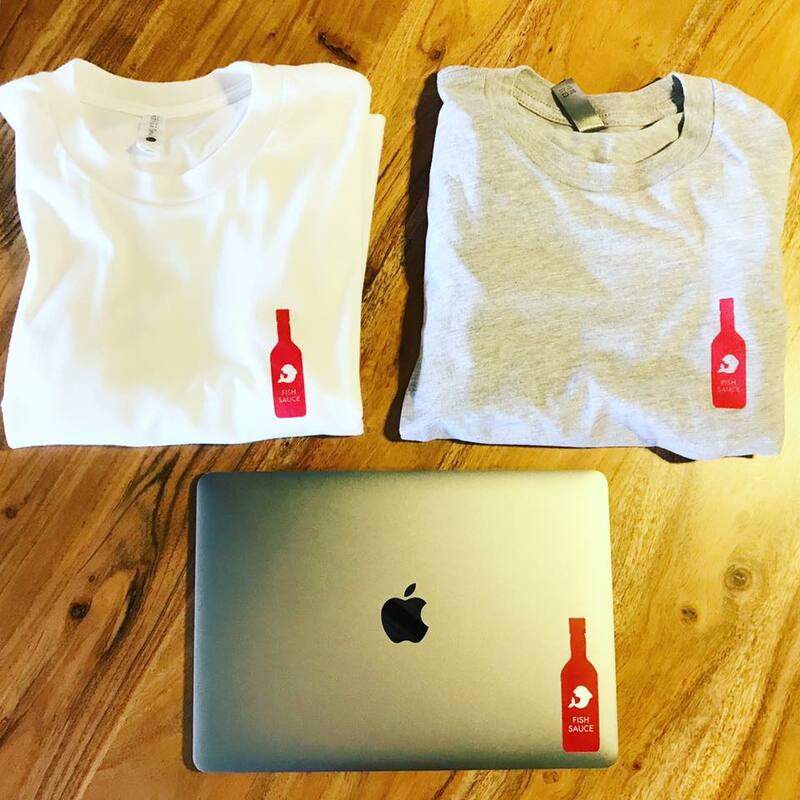 Featuring t-shirts, stickers, and (in the very near future) sweaters, the Swag Store is where members of the Fish Sauce Family who want to spread and rep the brand can snag some gear. When we first started Fish Sauce, we set out to create more than a podcast. We also wanted to create a brand that resonates with people, one they can be proud of wearing. When brainstorming and creating and our logo, our top priority was to create a simple icon that our Fish Sauce Family would enjoy and connect with! With an established logo, we shifted our Swag Store priority to choosing the highest quality shirt and fit. That way those who want to support Fish Sauce can do so in style and with comfort! If you haven’t seen the swag yet, check out www.fishsaucepodcast.com/swag — don’t forget to purchase a shirt! While we will forever remember launching our Swag Store and putting on our first Fish Sauce Live event, there’s a good chance our week’s biggest highlight was meeting with Philip Wang from WongFu Productions! Having grown up watching Phillip’s videos on Youtube and dreaming about one day meeting him, we had to seriously control our inner fanboys as we learned more about his Secret Sauce. Stay tuned for Phillip’s episode during Season 2! This past week was filled with many momentous milestones, and we thought it necessary for us to share our journey with you, our Fish Sauce Family. Thank you again for all the gratitude, love, and support! Look out for Season 2 this upcoming Fall! Enjoy our first post and subscribe to our newsletter for the latest episode updates and exclusive giveaways! Fish Sauce was dreamt of and born on May 10 and 12 (bday presents welcomed) in Los Angeles when Wilson and Elton were crying in their cribs in the newborn room, and have since been longtime friends. Since leaving the crib, our parents fed us fish sauce in nearly every meal, raising us in very similar foods and values. During our time at USC, we realized our paths were parallel, in engineering and student government, but intersected often in golf class, complaining or bonding over our failed attempts at our golf swings and recruiting. After both graduating, we shared the living room divided by only a thin pressurized wall in NY, where we began our corporate lives, Elton in finance, and Wilson in consulting. Despite aspiring to be Harvey and Mike from Suits, you could find us shoulder to shoulder with asian grandparents at Bo Ky, the local Cambodian, Vietnamese, and Chinese style duck noodle soup restaurant in Chinatown, NY. This moment represented an inseparable contrast between our roots and aspirations that foreshadowed our friendship and partnership. Many nights we pre-decided to “go out hard,” but ended up talking until 4am through the thin pressurized walls (the one advantage of cheap material) in our respective twin and full size beds that snuggly filled our 76 sq ft rooms. Yes, we snored, and we both heard it all. Though we were grateful of our current learning opportunity, we didn’t feel fulfilled from our day to day and concluded that tech would not only be purposeful but also fun seeing how disruptive it was. We bonded over our ridiculous interview questions that stumped us and the hidden conference rooms and lactation rooms that we took calls in. Wilson took a shotgun approach to recruiting flying out to SF nearly every week for a few months straight, while Elton took a rifle approach. The moral of that story is that both methods work (at least we’d like to think), as Wilson joined Square to build their business team, while Elton joined WeWork to expand to new markets, both of which are on a mission to empower entrepreneurs and creators. A year ago at Elton’s housewarming after one too many Yamazaki’s, we committed to starting a podcast combining how our Asian American roots have instilled values that have driven our career tension between a more traditional and entrepreneurial path. And the best way to find answers is to ask questions to successful Asian Americans who have taken that leap of faith, a decision many of us are conflicted over. The next day we met with one of our early partners at Los Altos Park in SF for half the day to jam on the future of Fish Sauce. That summer was a hectic one, squeezing recording after recording before Wilson headed to business school. We’ve developed a value of community in building product, which has served as our form of “capital” that fueled us in our early days - from sourcing speakers, to sharing the Fish Sauce gospel, and to providing critical but necessary feedback to us. Now 6 months since launch, it is truly incredible, even magical, to see our monthly unique listeners grow to over 3,000. It’s the texts, tweets, FB messages, IG messages, iTunes reviews, and in person feedback that have not only energized us, but also served as our board to guide us. All the support has been inspiring and fuels the passion that keeps us wanting to do more everyday. What started out as just passion project and now potential business have been nothing short of a community hustle, and it will only sustain if our listeners, speakers, mentors, friends, and family continue to care about our mission and each other. Fish Sauce is nothing without our quirky, smelly, but so f*king good listeners. Thank you! And this is why we call this community our Fish Sauce Family. Subscribe to our newsletter for the latest episode updates and exclusive giveaways!